Last month, we reviewed Diamond's DS3900 Ultra Dock which helps you expand an ultrabook or macbook to add more peripherals and other devices. Today, we will be reviewing the mini version of it, the MDS3900 mini docking station. Ultrabooks and macbooks sure is portable and lightweight but compared to laptops, they have less USB ports, video ports and so on. Read on and know more about this docking solution addresses that concern. Organize your Digital Workspace and do more things at one time. Diamond USB 3.0/2.0 to HDMI/DVI Mini Ultra Dock, Dual head multiple display monitors up to 2048x1152 including 1080P (Display Link DL-3900). 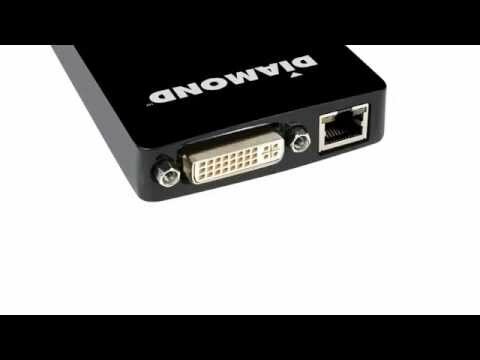 The Diamond MDS3900 USB 3.0 to HDMI/DVI Mini Ultra Docking station allow easy plug and play installation for multiple displays/monitors. Enhance your laptop's visual experience by adding 2,3 or up to 6 displays in minutes. (Each display requires an additional MSD3900 adapter, each adapter supports dual head video output, support for HDMI and DVI/VGA simultaneously.) Gigabit Ethernet support, upgrade or add Ethernet wired connectivity to your laptop, Macbook, and Ultradock with one single USB connection. Move on to the next page for the features and system requirements.